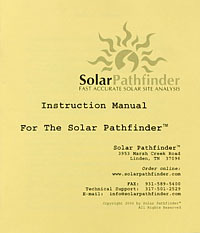 The manual currently has instructions on Solar Pathfinder™ set up and use and extra solar industry information. We've gone GREEN!! A free PDF of the manual is available here.